All of our wall stone is generally hand sorted according to size and shape. It is available by the ton. 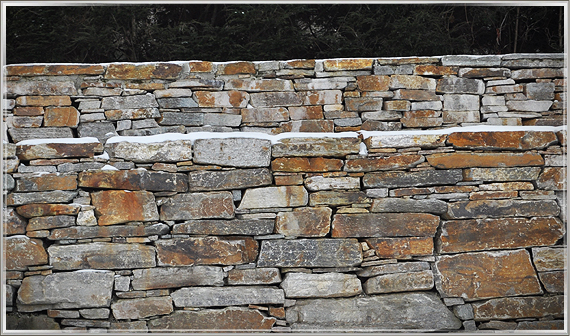 A large portion of our wall stone is manageable by one person. We also offer large wall stone which in most cases needs a machine to be moved and set in place. When ordering our wall stone please explain your specific application needs so our staff may ensure you are purchasing the product that will best meet your needs. If you are ordering a large quantity hand selection is not always an option due to it is extremely labor intensive. After calling and making an appointment customers are more than welcome to visit our quarry and hand pick your stone. Consultation on any wall stone installation is available at Unity Stone Quarry. Our Staff has over 30 years of experience installing walkways, patios, retaining walls, decorative walls, fireplaces, veneer applications, and chimneys.